Living in these days can mean a lot more than just having a shelter, food and clothing. People have evolved a lot in the last 50 years and the trend is of an exponential growth. The differences between generations will be more significant than there are now. As a proof that people have already started to change their minds and philosophy are the random bursts of nonconformism, meaning that some people no longer feel represented by the masses, and their image can't be associated with an institution of a large group of people. Americans' health, security, and economic well-being are tied to climate and weather. In the last 2 years, the United States experienced 25 climate- and weather-related disasters exceeding $1 billion ($115 billion total) in damages and claiming 1,019 lives. The public, businesses, resource managers, and policy leaders are increasingly asking for information to help them understand how and why climate conditions are changing and how they can prepare. The dramatic shift of the world's population into urban areas is encouraging citizens, city planners, businesses and governments to start looking at visions of 'smart' cities. Click here to look into what is driving the need to establish these networked environments, how smart city concepts and projects are different in the developing world, and what technologies and systems are needed to make them a reality. If you reduce your power usage, you can save money on the energy bill. If you decrease your power usage that means your lifestyle will also change, right? Wrong! There are many smart ways to save home energy that will not negatively affect your lifestyle, such as using one refrigerator, weatherizing the home, purchasing energy star-certified appliances, changing the rotation of your ceiling fan depending on the season, utilizing devices that are automated, and using low-wattage compact fluorescent bulbs. I believe that many individuals feel responsibility to reduce their impact on the planet. One major area where the developed world has a problem is with disposing of electronic equipment. The consumer world of electronics consists of cell phones, CD and DVD players, televisions, computers, audio equipment, and various portable electronic devices. I used to wonder what to do when one of these items broke down or, occasionally, when I simply needed or wanted to replace it with a newer, faster, more compatible equivalent. Walking on the beach, a mother and daughter observed thousands of starfish, stranded on the beach after a storm that had just ended. They felt bad for all the starfish, doomed to suffocate on dry land. Finally the daughter picked up one of the starfish, walked up to the water, and threw the starfish as deeply into the ocean as she could. If you are running a climate control system in your home, you must learn how to clean your central air vents, as doing it yourself will save you a lot of money. In addition, letting your vents sit there dirty can make your home unsafe, as it is possible for accumulated dust to catch on fire. In addition, you will find that the dirt and mold from your air vents will be blown through the vents and into your home, which can cause additional health problems. If you have children or elderly people living with you, the respiratory problems that arise can be deadly, so taking the time to clean your central air vents should be a top priority for any homeowner. This video "mockumentary", starring a plastic bag and the voice of Jeremy Irons, really should be seen. Plastic as a whole involves toxicity from start to finish, and its chemical components have penetrated every part of the planet, including our human bodies. The chemical industry is one of the prime suspects in the great rise of autoimmune disease in recent years. The humor and clever parody of the BBC "Earth" series, makes the topic quite a bit more enjoyable to watch, despite the serious underlying message. World Wildlife Federation has a brilliant series of images dramatizing the impact and urgency of global warming. One sample accompanies here. See the others here. The Zen teacher Thich Nhat Hanh explains in his new book how a Buddhist approach could benefit ecology. The Zen teacher Thich Nhat Hanh has turned his attention to how Buddhism could help ecology. 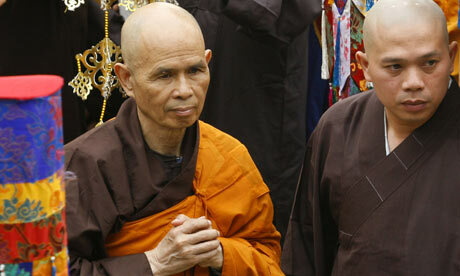 There is something extraordinarily child-like about the 84-year-old Zen Buddhist master Thich Nhat Hanh. To portray him out of context could make him appear naive and unworldly. It is therefore understandable that he does not like to be interviewed by journalists who have not already spent some time in his presence and meditated with him. The Daily Mirror was interested in running a piece only if they could get a picture of him with a major celebrity, which is not particularly helpful since he believes fame is one of the key paths to suffering. We won a Gotham Green Award for 2010, on Earth Day! Thank you Gotham Networking for this award. See the attractive event brochure. Copyright © 2019 PlanetThoughts.org. All Rights Reserved. Except for blog items by David Alexander: Some Rights Reserved.